The Parks Alliance (TPA), the UK’s voice of parks, in response to the Government consultation on its ‘New Strategy for Sport’ calls for a study of the value of green prescribing. Recognising that investing in prevention is more cost effective than paying for the cure, the TPA calls for a clinical trial to provide the health sector with the verifiable evidence to warrant investment in green participation prescriptions. Green participation prescriptions are where GPs refer patients to non-clinical sources of support to improve their mental and physical health. Measures that could be prescribed include physical activity to address the root causes of ill health. It is already proven that sports participation and physical activity can help with both physical and mental health and well-being, promote personal growth and resilience and support community cohesion. 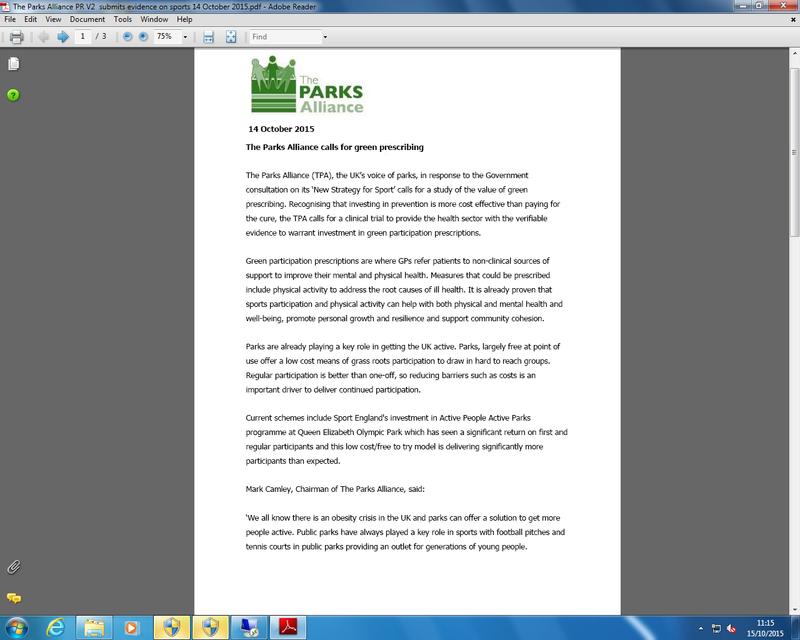 Parks are already playing a key role in getting the UK active. Parks, largely free at point of use offer a low cost means of grass roots participation to draw in hard to reach groups. Regular participation is better than one-off, so reducing barriers such as costs is an important driver to deliver continued participation. Current schemes include Sport England’s investment in Active People Active Parks programme at Queen Elizabeth Olympic Park which has seen a significant return on first and regular participants and this low cost/free to try model is delivering significantly more participants than expected. ‘We all know there is an obesity crisis in the UK and parks can offer a solution to get more people active. Public parks have always played a key role in sports with football pitches and tennis courts in public parks providing an outlet for generations of young people.